Eminem dropped new surprise album "Kamikaze" late Thursday night, the follow-up to 2017's "Revival." At midnight on the East Coast, he tweeted the link to the album and wrote, "Tried not 2 overthink this 1... enjoy" along with a middle finger emoji. The rapper posted album art from "Kamikaze" as well. The cover shows the tail of a fighter plane that says "FU-2," while the back of the album shows the front of the plane crashing. Eminem teamed up with longtime collaborator Dr. Dre to executive-produce the album. The 13-track album features artists Joyner Lucas, Eminem's manager Paul Rosenberg, Royce Da 5'9" and Jessie Reyez. The album also includes Eminem's track from upcoming Marvel villain movie "Venom," starring Tom Hardy. On Thursday, Eminem teased his song from the movie on Twitter. Eminem released his last album, "Revival," last December. He promoted the movie with a spaghetti pop-up in Detroit. 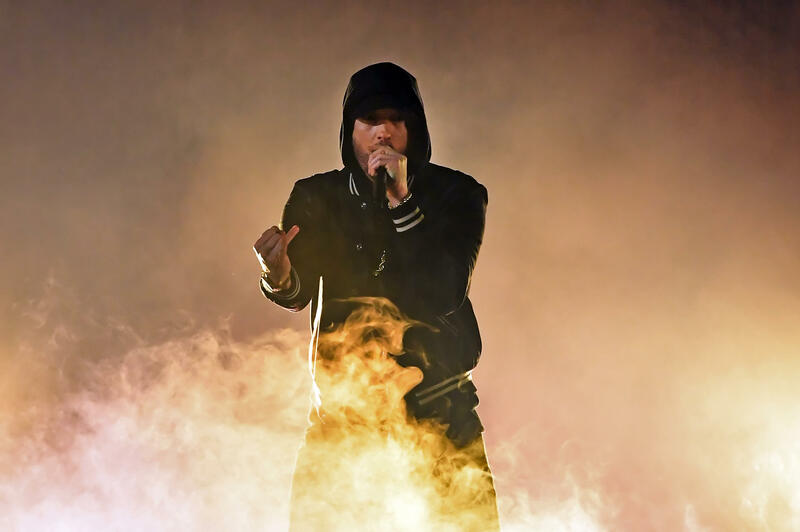 Last year, Eminem made headlines when he slammed President Trump in a freestyle rap called "The Storm" at the BET Hip Hop Awards. "This is his form of distraction, plus he gets an enormous reaction when he attacks the NFL, so we focus on that instead of talking Puerto Rico or gun reform for Nevada or these horrible tragedies, and he's bored and would rather cause a Twitter storm with the Packers," Eminem rapped. Eminem told his fans they had to pick sides. "Any fan of mine who's a supporter of his, I'm drawing in the sand a line -- you either for or against," he said. After using an expletive, Eminem said "the rest of America, stand up."